I got to thinking about the records of the sea level height taken at tidal stations all over the planet. The main problem with these tide stations is that they measure the height of the sea surface versus the height of some object attached to the land … but the land isn’t sitting still. In most places around the planet the land surface is actually rising or falling, and in some places, it’s doing so at a surprising rate, millimeters per year. In Part 1, we learned about carbon isotopes: how 14C forms in the atmosphere, how different isotopes move through the Carbon Cycle, and how isotopic measurements reveal clues about our changing climate. In this post we will look at how measurements of changing isotopic ratios are described. Check out this NOAA link for more. And if you have more time check out the entire series on isotopes. I can’t recommend it enough! Greens who celebrated China’s switch to gas are now worried the plans seem to be in disarray, as rushed conversions trigger a gas supply crisis. But behind the scenes, China is pursuing a gas production plan so carbon intensive, even Chinese greens are openly criticising central government policy. The data for November 2017 HadCRUT4 (click on image to enlarge) has just been released by the UK Met Office. It is 0.547, better expressed as 14.55 +/- 0.10 °C. Given the substantial monthly variability evident in this database one has to be careful in drawing many conclusions about it. Given that, it is interesting to note that November 2017 is statistically the same as most Novembers of the so-called pause years, i.e. 1997, 2001, 2004, 2005, 2006, 2008, 2009, 2010, 2010, 2012, 2014 and even 2016. Sixteen years ago, the world’s leading climate experts said: “Milder winter temperatures will decrease heavy snowstorms” in North America. Pennsylvania just shattered all of their all-time snowfall records, and temperatures in most of North America are near record cold. 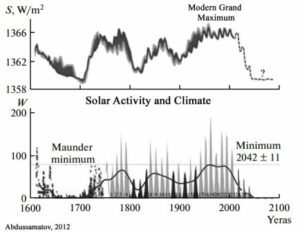 What follows are 6 recent studies presented by Lüning and Vahrenholt, which dump cold water on the claim storms will get more frequent and intense. The studies fly in the face of a recent Nature editorial piece, one filled with the usual worn out alarmist propaganda language of climate doom we’ve been seeing for over a quarter century. The editorial claims some scientists have already found the link between “weird weather” and greenhouse gases.